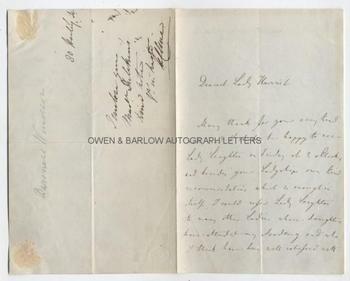 LOUISE DULCKEN autograph letter Signed. ALS. 3pp. 80 U.P. June 16th 1848. To Lady Harriet [Clive, wife of Sir Robert Clive]. "Many thanks for your very kind note, and I shall be happy to see Lady Leighton on Friday at 2 o'clock, and besides your Ladyship's own kind recommendation which is enough in itself, I could refer Lady Leighton to many other Ladies whose daughters have attended my Academy and who I think have been well satisfied with the progress made, as many have continued for 4 seasons. Should Lady Leighton wish to hear the little people I should beg her to come at 10 in the morning as the less advanced classes play then. 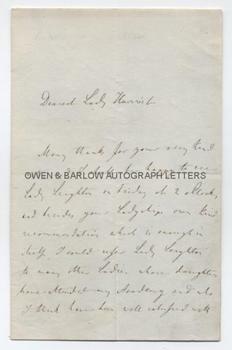 Once again dearest Lady Harriet a thousand thanks for all your kind thoughts of me... [etc]". With a post script: "Could Miss Mary come to me at half past 3 instead of 5 tomorrow. If she could I can give her a longer lesson". 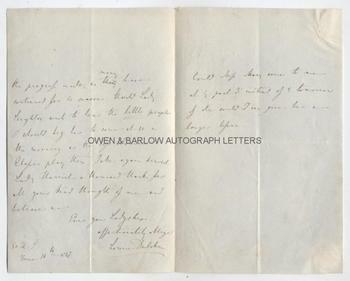 With Lady Harriet Clive's autograph note on the verso "I enclose Mad[am]e Dulcken's kind note. Yrs in haste, H. Clive". 8vo. Approx 7 x 4.5 inches. Mounting traces to two corners on verso of last leaf, else fine. Louise Dulcken was the younger sister of the great Leipzig violinist Ferdinand David. She showed exceptional talent from an early age and studied under F.W. Grund at Hamburg. She made her first public appearance at age 10 and had successful European tours. She settled in London and for many years was a soloist with the Royal Philharmonic. Louise Dulcken gave the first English performance of Chopin's 2nd Piano Concerto in 1843. Her musical soirees became popular events and her annual concert was high on the social calendar. She was a renowned wit, as well as a virtuoso musician, and her weekly receptions were gathering places for artists, musicians and literary figures. She established an academy and the young Queen Victoria was among her many pupils. Lady Harriet Clive (1797-1869) was the wife of Sir Robert Clive (1789-1854) and, on his death, became Baroness Windsor in her own right. Autograph letters of Louise Dulcken are somewhat uncommon.